BMW is once again expanding their model range. The BMW 5 Series Gran Turismo is as unique vehicle that combines the essential features of a luxury saloon, a modern Sports Activity Vehicle, and a classic Gran Turismo. Stylish and elegant in design, this unique four or five-seater is emphasised by the coupé-like roofline, long bonnet, generous wheelbase and two-piece tailgate. The extra-large and light flooded interior offers luxurious comfort, a slightly elevated seating position for comfortable and convenient access as well as superior all-round visibility and truly impressive variability. For the first time on a BMW all four doors are frameless – a design solution that not only indicates the vehicles coupé-like silhouette but also emphasises the elongated roofline in the finest tradition of a Gran Turismo. Superior performance is ensured by powerful yet fuel-efficient engines which, thanks to comprehensive BMW EfficientDynamics features, all conform to the EU5 emissions standard. Customers can choose between a 180 kW six-cylinder in-line diesel unit, a new 225 kW six cylinder in-line petrol engine, and a 300 kW V8 petrol engine, the latter two fitted with BMW TwinPower Turbo technology and High Precision Injection. The 5 Series Gran Turismo features fuel saving measures employed under the BMW EfficientDynamics banner allowing for unrivaled power and efficiency. Content includes Automatic Air Vent Control on the BMW 530d Grand Turismo, Brake Energy Regeneration and 8-Speed transmission on all models and High Precision Injection on the BMW 535i and BMW 550i Gran Turismo. The new BMW 5 Series Gran Turismo combines elegance, spaciousness and functionality in one package. It builds on the strengths of existing vehicle concepts and fulfills the high expectations of customers looking for a vehicle catering not only for business but also for sports, leisure and family time. The twin boot lid of the new BMW 5 Series Gran Turismo ensures extraordinary versatility and flexibility. As an alternative to opening the entire boot lid, which enables the loading and unloading of large items, the small boot lid below the rear window can also be opened separately. The benefit: smaller luggage items can be stored quickly and conveniently, while the passengers – unlike in an SAV or Touring are protected from noise and outside weather conditions when the partition wall is locked in place. The large boot lid can be opened to accommodate bulkier items. The maximum tailgate opening height is 2,290 mm and can be adjusted via the iDrive menu. The small boot lid can be opened separately and makes it quick and easy to put small items in the luggage compartment. Positioned between the new BMW 5 Series sedan and the range topping BMW 7 Series, the new BMW 5 Series Gran Turismo reflects the exclusivity and luxury of ‘first class travel’. In keeping with this unique market positioning are the high levels of standard equipment for the entire model range. These include Dynamic Drive Control 4-zone automatic air conditioning, Adaptive headlights, Bi-xenon headlights, Automatic tailgate operation, Comfort access, Head-up display, Panorama sunroof, Rear view camera, Metallic paint, Navigation (Professional navigation standard on the BMW 535i Gran Turismo and BMW 550i Gran Turismo), Lumbar support, DVD changer and USB audio interface. As its name alone indicates, the BMW 5 Series Gran Turismo is ideally suited for a wonderful travel experience. The luxurious ambience immediately makes the driver and passengers feel at home, legroom at the rear is the same as in the BMW 7 Series, headroom is equal to that of the BMW X5. The tilt angle of the rear-seat backrests, in turn, adjusts individually to the respective, personal requirements of the passengers. And with the rear seats moving forward and back by up to 100 millimetres, together with the backrests tilting forward completely if required, luggage capacity may be enlarged up to 1,700 litres. BMW EfficientDynamics entering a new segment. The drivetrain technology featured on the new BMW 5 Series Gran Turismo comes with a wide range of innovations, the benefits provided by BMW EfficentDynamics now provide a unique balance of performance and fuel economy. Making its world premiere in BMW 535i Gran Turismo is a new straight-six power unit, for the first time combining turbocharger technology, High Precision Injection, and BMW’s fully variable VALVETRONIC valve management. Displacing 3.0 litres, the BMW TwinPower Turbo delivers 225 kW at an engine speed of 5,800 rpm, with an equally outstanding, spontaneous and direct response as well as peak torque kept consistently at 400 Newton-metres from 1,200–5,000 rpm. The top-of-the-range power unit is the V8 TwinPower Turbo with High ­Precision Injection in the BMW 550i Gran Turismo, developing maximum output of 300 kW between 5,500 and 6,400 rpm. The BMW 530d Gran Turismo, to round off the range, offers particular highlights in terms of all-round economy. Its latest-generation 3.0 litre straight-six diesel comes with an all-aluminium crankcase as well as common-rail direct fuel injection with piezo-injectors, delivers 180 kW at 4,000 rpm, and gives the car average fuel consumption in the combined EU cycle of just 6.5 litres/100 kilometres , as well as a CO2 emission rating of just 173 grammes per kilometre. All engines fulfil the EU5 emission standard. In addition, all variants of the BMW 5 Series Gran Turismo come with an innovative eight-speed automatic transmission combining an extremely quick gearshift with maximum efficiency. Other key BMW EfficientDynamics technology features include Brake Energy Regeneration with instrument cluster display, Air Vent Control (BMW 530d Gran Turismo), Low Rolling Resistance Tyres and light weight aluminum panels. Through its wide range of qualities, the BMW 5 Series Gran Turismo meets all the demands of a modern target group looking for a vehicle providing harmony in meeting all kinds of requirements and demands in life – both as a prestigious and elegant company car and as an active leisure-time vehicle. Design: versatile sportiness, stylish elegance. In its exterior design, the BMW 5 Series Gran Turismo offers a unique combi­nation of versatile sportiness and stylish elegance. Proportions typical of BMW, four doors with frameless windows and a coupé-like stretched roofline all come together in perfect harmony authentically reflecting the many qualities of the car. The front view is 'characterised' first and foremost by the strong presence of the low-slung BMW kidney grille, the large air intakes and the characteristic dual round headlights. The BMW kidney grille itself is slanted slightly to the front, its upper edge forming the foremost point on the body. The dual round headlights likewise slanted at an angle and extending far into the side panels merge at the top into a matt trim cover, thus generating the clearly focused look so typical of the BMW brand. Apart from the direction indicators, the corona rings on the headlights come for the first time with LED light units. Included in the standard Bi-xenon headlights the LED units may be operated in two stages: Dimmed to approximately 10 per cent of their full power, the LED light units serve as positioning lights. Operated at full power, on the other hand, they act as daytime driving lights in a particularly brilliant white. A further feature immediately recognisable from the side is the waistline at the level of the door openers characteristic of BMW, extending from the outer edge of the headlights, rising slightly along the entire length of the car, and continuing all the way to the contours of the rear light clusters. The two outer rooflines as well as the 'shoulder' lines come together in the airflow spoiler on the tailgate, giving the fastback-like rear end an almost compact look. Otherwise, horizontal lines dominate the rear view of the car, with the look of power and 'muscle' being further underlined by the wheel arches flared far to the outside. The rear light clusters merge far into the side panels, ensuring that the full width of the BMW 5 Series Gran Turismo also comes out clearly in the car’s night design. Rows of lights fed by LED light units provide a homogenous light pattern, again giving the BMW 5 Series Gran Turismo a distinctive look on the road and making sure that the car is always clearly recognisable. The interior: generous space and comfort, individual luxury. The unique feeling of space within the BMW 5 Series Gran Turismo is enhanced by the shape and design of the interior features, the interior colour scheme, and the choice of materials. The dashboard is subdivided horizontally and comes with a cockpit featuring Black Panel technology and a Control Display for BMW iDrive measuring up to 10.2" in size. Apart from the electronic gear selector lever, the switches for Dynamic Drive Control as well as the iDrive Controller are arranged conveniently on the centre console. Both the driver and front passenger benefit from their slightly elevated seating position, this so-called semi-command position allowing very comfortable and ergonomically ideal entry to the car and providing an optimised overview of traffic conditions in the area. The impression of a self-contained space surrounding – or, even more appropriately, cocooning – the car’s occupants is further enhanced by the harmonious shapes and colours of the panels on the front and rear doors. The interplay of ascending and descending lines and contours throughout the entire length of the interior provides a homogenous picture forming an optimum link connecting the front and rear seats. As an alternative to the rear-seat bench for three passengers, featured as standard, is an option for the BMW 5 Series Gran Turismo is two single seats, in which case the adjustment of the seat position as well as the backrest angle and height of the head restraints is all-electric. Even greater comfort when loading: two-piece tailgate and partition between the passenger and the luggage compartments. The two-piece tailgate featured for the first time on a BMW ensures maximum comfort and variability when loading. The two sections offer the choice of a small opening beneath the rear window and a large lid like on BMW’s X models. Both sections may be opened and closed individually, with the large tailgate featuring Soft Close Automatic. The unique partition between the passenger compartment and the luggage compartment ensures unrestricted comfort also while loading. Whenever, with the partition closed, the driver and passengers open only the lower section of the tailgate, the passenger compartment will not be affected in any way while loading by draughts or other effects of weather, or by any noise or acoustic annoyance. As long as the rear seats and the partition are in their standard position, luggage compartment capacity is 440 litres. Moving the seats forward and unfastening the partition increases luggage capacity to 590 litres. And when folding down the rear-seat backrests as well as the partition, the driver and passengers benefit from no less than 1,700 litres. New straight-six power unit: first-ever combination of turbocharging and VALVETRONIC. A particular highlight of this new model is the newly developed straight-six petrol engine that makes its debut in the world market. For the first time it combines turbocharger technology, High Precision Injection, and variable VALVETRONIC valve management all in one. This unique combination gives the new BMW TwinPower Turbo spontaneous and direct response to the acceleration, exceeding even the response already offered by BMW’s existing straight-six turbocharged engine. This truly impressive response is the result of VALVETRONIC technology optimised once again as well as the turbocharger system applying the twin scroll principle to separate the ducts of three cylinders at a time both in the exhaust manifold and the turbocharger. BMW’s High Precision Injection has also been enhanced to an even higher standard of direct fuel injection technology. Now HPI features new injection nozzles precisely dosing the supply of fuel and operating at a pressure of up to 200 bar in the combustion chambers. Displacing 3.0 litres, the new six-cylinder develops maximum output of 225 kW at 5,800 rpm, with peak torque of 400 Newton-metres available all the way from 1,200–5,000 rpm. Benefitting from this kind of power, the BMW 535i Gran Turismo accelerates from a standstill to 100 km/h in 6.3 seconds. The car’s top speed, in turn, is limited electronically to 250 km/h. The exceptionally good balance of performance and fuel economy is clearly confirmed by average fuel consumption in the EU test cycle of 8.9 litres/100 kilometres. And at the same time the CO2 rating of the BMW 535i Gran Turismo is just 209 grammes per kilometre. Eight-cylinder with BMW TwinPower Turbo and High Precision Injection. The top engine in the BMW 5 Series Gran Turismo is a unique V8 combining TwinPower Turbo technology with High Precision Injection. Displacing 4.4 litres, this outstanding power unit develops maximum output of 300 kW in a speed range from 5,500–6,400 rpm. Peak torque, in turn, is 600 Newton-metres generated all the way from 1,750 to 4,500 rpm. This unparalleled V8 is the most efficient engine of its type and, at the same time, the world’s only petrol engine with the turbocharger and catalytic converters arranged within the V-section between the two rows of cylinders. The BMW 550i Gran Turismo accelerates from a standstill to 100 km/h in 5.5 seconds, with top speed limited electronically to 250 km/h. Average fuel consumption of the BMW 550i Gran Turismo in the EU test cycle, in turn, is 11.2 litres/100 kilometres, while CO2 emissions are 263 grammes per kilometre. Efficiency and pulling power: latest generation of diesel technology. The straight-six diesel in the BMW 530d Gran Turismo presents the latest in BMW engine development. Displacing 3.0 litres, this power unit comes with an all-aluminium crankcase, its turbocharger system with variable intake geometry providing a dynamic but smooth flow of power tailored to the driving conditions. Fuel is supplied by the latest generation of common-rail fuel injection using piezo-injectors operating at a maximum pressure of 1,800 bar. In practice, this means engine output of 180 kW at 4,000 rpm, with peak torque of 540 Newton-metres from just 1,750 rpm. The BMW 530d Gran Turismo accelerates to 100 km/h in just 6.9 seconds and reaches a top speed of 240 km/h. This sporting performance comes together with average fuel consumption of just 6.5 litres/100 kilometres in the EU test cycle. And the CO2 rating of the BMW 530d Gran Turismo, finally, is just 173 grammes per kilometre. Innovative, dynamic, efficient: eight speed automatic transmission featured as standard. All model variants come as standard with the eight-speed automatic transmission so far available only in the twelve cylinder BMW 760i saloon. This new transmission combines gearshift comfort, sportiness and efficiency never seen before, serving to an even greater extent to reduce fuel consumption and emissions. The new eight speed automatic transmission excels through its igearset configuration providing additional gears and a wider range of gear increments without any effect on the size, weight, and inner efficiency of the system. All variants of the BMW 5 Series Gran Turismo come as standard with BMW EfficientDynamics, the various technologies offered varying from one model to the other according to its particular character. Among other features, Brake Energy Regeneration, on-demand control of the car’s ancillary units such as the electrical coolant pump, the electrical steering assistance pump, the map-controlled oil pump and the detachable a/c compressor, as well as ­consistent light weight technology, optimised aerodynamics including active management and control of the air flaps and, finally, tyres with minimum roll resistance ensure optimum fuel economy and emission management. Cutting-edge suspension technology for comfort, dynamism, and precision. The modern suspension technology of the BMW 5 Series Gran Turismo serves to ensure a wonderful motoring experience, driving supremacy and outstanding safety at all times and under all conditions. One of the features that makes this possible is the combination of a double track control arm front axle and an Integral-V rear axle. In addition, the BMW 5 Series Gran Turismo comes as standard with air suspension on the rear axle, 18-inch light-alloy wheels on the BMW 530d Gran Turismo, 19-inch light-alloy wheels on the BMW 535i Gran Turismo and 20-inch light-alloy wheels BMW 550i Gran Turismo complete with a high-performance brake system. DSC Dynamic Stability Control, also comprises an electromechanical parking brake with its own Auto-Hold function. As an alternative to hydraulic rack-and-pinion steering with Servotronic featured as standard, the BMW 5 Series Gran Turismo is available, as an option, with Integral Active Steering featured for the first time on the new BMW 7 Series. As function of road speed, this unique steering influences steering forces by way of Servotronic and the steering angle by means of the Active Steering Transmission on the front axle. Integral Active Steering also controls the steering angle on the rear wheels, thus giving the BMW 5 Series Gran Turismo even greater agility in city traffic and ensuring extremely smooth and superior lane change and handling in bends also at high speeds. Optional for even greater dynamics and additional comfort: Adaptive Drive. The BMW 5 Series Gran Turismo is available as an option with Adaptive Drive combining electronically controlled dampers and active anti-roll stabilisation. These highly innovative dampers adjust individually both to road conditions and the driver’s style of motoring in order to prevent any undesired movement of the car. BMW is the world’s first car maker to use a damper system with the adjustment of the inbound and rebound strokes in a continuous, independent process. At the same time active anti-roll bars on the front and rear axle reduce body sway in bends to an absolute minimum, thus providing an even higher standard of comfort and agility. Featured as standard: Dynamic Drive Control for individual set-up of the car according to current requirements. The BMW 5 Series Gran Turismo comes as standard with Dynamic Drive ­Control for an individual set-up of the car in all its main features. This high-tech system influences the progressive curve on the accelerator, engine response, the map control line for steering assistance, the gearshift dynamics on the eight speed automatic transmission, and the response thresholds of DSC Dynamic Stability Control. Dynamic Drive Control is activated by a button on the centre console directly next to the gear selector lever. Using this toggle function, the driver is able to choose among the NORMAL, SPORT, and SPORT+ modes. In combination with Adaptive Drive, the system also serves to control the damper curves by way of Dynamic Drive Control, in this case providing the additional COMFORT mode as a further option. Innovative in design and construction: aluminium doors and panorama glass roof. Apart from the engine compartment lid and the front spring struts on the body, the doors on the BMW 5 Series Gran Turismo are also made of aluminium. Serving as an outstanding design and construction feature, they reduce the overall weight of the car by 28 kg. And as a further highlight the BMW 5 Series Gran Turismo is the first large-scale production car from BMW to feature frameless windows in aluminium shell structure. The panorama glass roof fitted as standard on the BMW 5 Series Gran ­Turismo provides an even brighter and, at the same time, more spacious ambience throughout the interior. Measuring 116 centimetres in length and 94.2 centimetres in width, the panorama glass roof provides an opening of up to 44 centimetres. With the rear glass section bolted firmly to the body of the car, body stiffness is enhanced accordingly for even smoother driving conditions. Optimum occupant safety on all seats. Extra-strong load-bearing structures, generously dimensioned and exactly defined deformation zones, as well as highly efficient restraint systems masterminded by high-performance control electronics set the standard for the high level of passive safety the BMW 5 Series Gran Turismo has to offer. To optimise passive pedestrian safety, in turn, both the bonnet and the side panels give way individually in the event of a collision. Over and above frontal and hip/thorax airbags, the car’s standard safety features include curtain head airbags at the side, three-point inertia-reel airbags with belt force limiters, belt latch tensioners as well as crash-activated headrests. The BMW 5 Series Gran Turismo is standard with Bi-xenon and Adaptive headlights to ensure appropriate illumination of the road ahead, following bends and winding roads in a flexible line. The Bending Light function is integrated in the headlights, while a ­further feature of the Adaptive Headlights is variable light distribution for ­optimum ­illumination of the road ahead also when driving straight ahead. BMW ConnectedDrive and the most advanced driver assistance systems. A number of BMW ConnectedDrive features arrive standard on the BMW 5 Series Gran Turismo and are exclusive developments offered only by BMW. These include cockpit and climate control featuring Black Panel technology, the iDrive control system complete with direct selection buttons, the unique range of navigation and audio systems with a hard disc memory, the Head-Up Display as well as the exceptional choice of innovative driver assistance systems. The driver assistance systems provided by BMW ConnectedDrive ensure maximum supremacy and safety on the road. These include the standard High-Beam Assistant, optional Lane Change Warning and optional Lane Departure Warning. The new generation of BMW Night Vision (optional) able to detect individual persons in the BMW 5 Series Gran Turismo, in turn, sets new standards in avoiding accidents while driving at night. Cruise control complete with a brake function is standard, while Active Cruise Control with Stop and Go comes as an option, maintaining a consistent distance from the vehicle ahead by intervening in drive management and building up brake pressure whenever required. Keeping a close eye on everything: PDC Park Distance Control, Rear View and Surround View Camera. 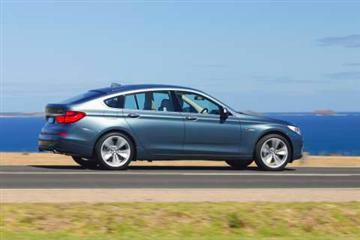 The new BMW 5 Series Gran Turismo comes as standard with PDC Park Distance Control at the front and rear. This is supplemented by a Rear View Camera, with Surround View also available as an option. Surround View consists of Side View and Top View. Side View uses two cameras integrated in the front wheel arches enabling the driver to check out traffic coming from the side at an early point. Top View provides an even more detailed overview of road conditions with the help of two additional cameras integrated in the rear-view mirrors. Data provided by the Top View cameras, by the Rear View Camera and the PDC sensors on the vehicle and its surroundings is processed by a central computer generating an overall image presented in the Control Display and showing both the car and its surroundings from a bird’s eye perspective. 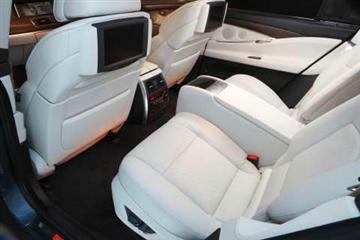 Automatic air conditioning and personal entertainment for your individual well-being. Featured as standard, four-zone automatic air conditioning allows the driver, front passenger and rear passengers the ability to set the temperature, the amount and the distribution of air via the control unit on the climate control panel, individually for the right- and left-hand side of the car. Likewise featured as standard on the BMW 5 Series Gran Turismo, the audio system boasts both a CD player, six-DVD changer and USB/AUX-In port. A hard disc memory, in turn, makes the optional navigation system Professional (standard on the BMW 535i Gran Tursimo and BMW 550i Gran Tursimo) particularly easy and convenient to use. With its capacity of 80 GB, the memory allows particularly fast access to the digital navigation maps and offers no less than 12 GB additional capacity for a large collection of music files. Optional features include a TV module (standard on the BMW 550i Gran Turismo) and entertainment systems available on the rear seats of the BMW 5 Series Gran Turismo with their 8 and, respectively, 9.2 inch screens integrated in the backrests of the front seats ensure particularly comfortable and pleasant motoring. Hands-free communication thanks to full integration of mobile phones and Smartphones. The standard hands-free communication with a Bluetooth interface allows additional safety and superior comfort in making telephone calls while driving. A snap-in adapter including a USB port comes as yet a further option for the full integration of Smartphones with an MP3 function. Using this option, the driver and passenger are able to use both the communication and entertainment functions of their mobile phone and mastermind all functions via iDrive. Spoilt for choice with an extended colour pallet both inside and out. In terms of exterior paint colours, upholsteries and interior trims the new BMW 5 Series Gran Turismo is available with extended colour pallet, with no additional cost for metallic paint. Exterior colours range from Alpine White and Black as non-metallic colour options and also in the following metallic colours as no-cost options: Titanium Silver, Black Sapphire, Deep Sea Blue, Space Grey, Milano Beige, Neptune Blue, Imperial Blue Brilliant Effect, Sophisto Grey Brilliant Effect, Orion Silver and Damast Red. On the inside, luxury Dakota leather is standard and is available in Black, Everest Grey, Veneto Beige, Ivory White/Black, Ivory White/Ivory White and Cinnamon Brown. Exclusive Nappa leather with extended contents is available as an option. 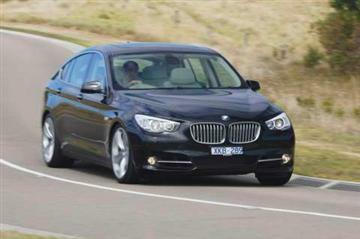 Pricing of the exclusive new 5 Series Gran Tursimo will be positioned in between the new BMW 5 Series and BMW 7 Series. Equipment and standard specification levels reflectived of its premium positioning. * Manufacturer’s Recommended List Price is shown and includes GST and Luxury Car Tax (LCT) but excludes dealer charges, stamp duty, statutory charges and on-road charges which are additional and vary between dealers and States/Territories. The BMW 5 Series Gran Turismo – Specifications. Standard: DSC including ABS, Cornering Brake Control (CBC), Dynamic Brake Control (DBC), Automatic Stability Control (ASC), Electronic Brake Force Distribution (EBD), Trailer Stability Control, Drive Dynamic Control (DDC).